The concept of a Digital Watch is not new. Throughout the 19th century, pocket watches were made utilizing rotating wheels versus hands circling a watch face. 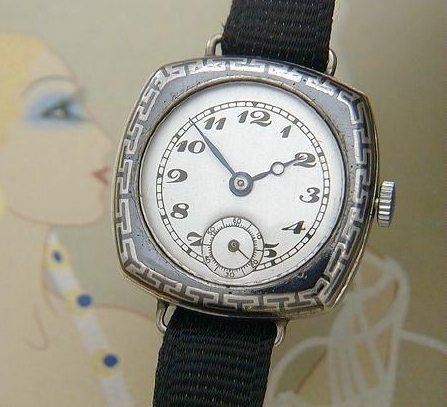 As wristwatches were searching for an identity and the Deco Era was forcing watch designers to come up with innovative, sleek ideas - the digital, or jump-hour concept was revived. This phenomenal example of progressive styling and engineering is a digital, or jump-hour wrist watch, crafted as a post-modern element: their stark, industrial lines were considered on the cutting edge of style. As with earlier pocket watches, there are no hands on these examples; instead, the time is displayed by wheels that rotate as the watch runs. Typically, the manual watch movement is contained in a rectangular, brushed chrome case. The idea was a novelty in the Jazz age and surfaced as a design concept during the '60s; now, collectors are re-discovering the panace of a mechanical digital wristwatch! This genuine, unusual example is in quite good shape for the genre, and is in fine working order, measuring approx. 34mm lug-to-lug by 16mm wide. Not only have we CLEANED, OILED AND CALIBRATED this special timepiece, we've fitted it with a new strap so that it can be worn and admired!